VCA is the name of the occupational safety management system used by companies in the Netherlands and Belgium (often also in Germany, Austria, Switzerland and the Scandinavia). The VCA abbreviation means Veiligheid Gezondheid Milieu Checklijst Aannemers (Safety, Health, Environment and Subcontractor's Checklist). The subcontractor's checklist is an extended list of questions, the main purpose of which is to ensure the safety of all employees in the workplace. One of the primary requirements of the VCA system is the possession by employees and subcontractors of the VCA certificate. VCA is a versatile program and aside occupational safety, it helps companies manage health and environmental protection, and employees - to execute work in a safe manner. Companies that incorporate the VCA system substantially improve the occupational safety of their employees and limit the number of accidents. 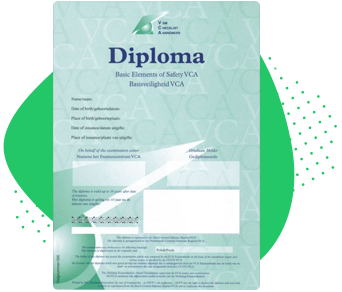 The VCA certificate is issued in the form of a green diploma, it includes the VCA logo and is valid for 10 years. The VCA certificate is issued along with the VCA card. In the Netherlands, it is necessary to have the "green" VCA certificate accredited by the Dutch VCA Infra institute. The Personal Safety Logbook is an additional document which includes up-to-date training courses and permits, including the VCA (Veiligheidspaspoort). 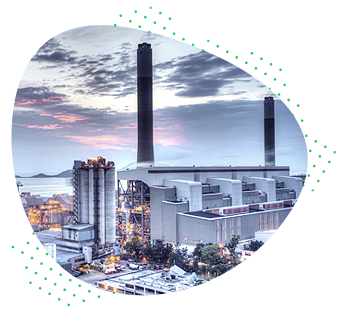 The VCA certificate is required in companies based in the Netherlands, Belgium and other EU states, which execute high-risk works in the following disciplines: petrochemical, construction, heavy industry and many others. Possession of the VCA diploma is confirmation of the knowledge and application by the employee of the occupational safety principles and is an official permit to commence the works. An increasing number of companies and employers requires the VCA diploma. The VCA certificate is valid for 10 years! The VCA document is valid for the period of 10 years. The online database with the VCA certificates numbers is available at www.vca.ssvv.nl administered by the Infra VCA Institute based in the Netherlands. The VCA Basic certificate is intended for line employees. The training lasts for 8 hours, while the exam lasts for 60 minutes and consists of 40 questions. The VCA Basic exam is available in Polish, English, German, Dutch, Slovakian, Romanian, Hungarian, Italian, Portuguese, French and other EU languages. The VCA VOL certificate is dedicated for directors, managers and persons conducting their own business activity. The VCA VOL exam is only available in English, Dutch, French or German. One-day stationary training (8.00-17.00), including notions concerning the safety, health and environment management system (acc. to the VCA/SCC 2008*05 standard). The training is conducted in Polish (other languages available on demand: English, Dutch, German, Romanian). Getting the employees/subcontractors acquianted with the regulations concerning working on high-risk stations and improving their awareness of occupational safety. Information lecture, chat, clarifications, problem-related lecture, video, pictures, discussion, working with text (answering test questions). The VCA Basic exam lasts 60 minutes and consists of 40 single-choice questions. It is necessary to provide at least 28 correct answers to pass the exam. The VCA VOL exam lasts for 75 minutes and consists of 70 single-choice questions. It is necessary to provide at least 49 correct answers to pass the exam. The VCA VOL exam is only available in English, Dutch, French and German. The VCA exams are taken on computers (in exceptional cases, in the form of paper tests) and are conducted by independent examiners accredited by the VCA Infra body. The VCA online trial test provided by VCA Polska® is free of charge and allows you to familiarise yourself with sample questions and correct answers in Polish, English, Dutch and German.